petição: Stop the horrific cruelty to sheep and lambs during shearing! Stop the horrific cruelty to sheep and lambs during shearing! I am an animal lover and rescuer. I have had to have rabies shots because I have tried to rescue stray animals. There is no animal I would not petition for the cause to be treated kindly. I stumbled upon this video and felt immediatelly connected to this because of all of the wool Americans buy, including myself. But no more! I will NOT be purchasing wool ever again unless the way sheep are cared for and sheared changes in these shearing sheds. If the men and women are paid by the number of sheep they shear so they do it in a hurry, maybe the money is not worth it. Maybe they could slow down a bit for the sake of the animal and try being gentle, thinking that these animals do feel pain. Animals do not cooperate when they are frightened. Shearing sheds should take a stand and only hire workers who will take time to treat the sheep decently. If they do not, we should not purchase wool from these places, and from the countries that allow this to go on. 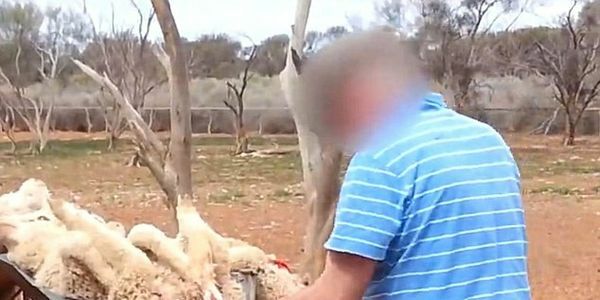 Many shearers have commented on other pictures like the one above, saying they own sheep on their personal farms and never would shear a sheep this way. So, I know it is possible to do this humanely. Sheep farmers do it humanely all the time. Let's stop pretending we don't know what is happening and putting it in the back of our minds and forgetting. Who will speak out for these gentle creatures?